Edited by Mark Bender, a specialist of Chinese literature and folklore at The Ohio State University, this book is a collection of poems penned by writers from various Asian border regions—Northeast India, Myanmar, the Southwest and Inner Asian frontiers of China, and Mongolia. Although some of the poems, especially those by Northeast Indian poets, were originally written in English, most are translations—from Burmese, Mongolian, Chinese, Tibetan, Nuoso, Hani, Khasi, and Manipuri—done by a group of translators. In translating these poems into English, the global “language of interaction” (p. xxi), the voices of poets from the borderlands of Asia can be heard by a wider audience. Bender’s informative introduction gives his readers a broad context for understanding the complicated histories and cultures of the areas and the poets included in the volume. This collection is published as part of the Cambria Sinophone World Series. Sinophone, according to Shu-mei Shih, “encompasses Sinitic-language communities and their expressions (cultural, political, social, etc.) on the margins of nations and nationalness in the internal colonies and other minority communities in China as well as outside it.” The book includes many poems from Sinitic-language cultures and communities on the margins of China. 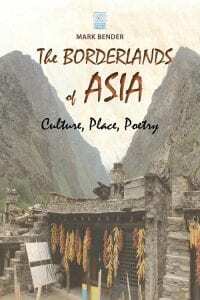 However, the borderlands of Asia also largely overlap with what has recently been referred to as Zomia—a term Bender chooses not to use—an area mainly encompassing the highlands of Southeast Asia (areas at altitudes above 300 meters across parts of Vietnam, Cambodia, Laos, Thailand, and Burma); four provinces of southwest China; and Tibet, Nepal, Bhutan, and Northeast India. Pakistan, and Afghanistan are sometimes included as Zomia’s fringes. It is a realm for peoples of diverse origins and cultures who have tended to evade modernity and nation-state formation. Considering this distinction, the collection can be seen as drawing (poetic) connections between the Sinophone and Zomia. In addition to highlighting the ecocritical aspects of the poems in the volume (p. 14), Bender’s introduction contributes to a growing awareness of the peoples and cultures of Zomia and Sinophone communities of the margins. People transform space into place through the process of inhabiting an environment; the cultural adaptability and knowledge they obtain through human interactions help them shape and conceptualize that environment. The different conceptualizations of place in this collection are associated with various histories and ethnic identities. For example, Pyae Sone Win’s “The Trade Mark” (pp. 177-180) draws a connection between Kachin identity and traditional territories and sites (such as Ayeyawaddy and Bagan). Erdenebaatar Khuuduu’s poem “Blue Mountains of Uriankhai” associates the Khalkha steppe and the Blue Mountains of Uriankhai with specific features and geography within a more general Mongolian identity. This kind of niche-identity signification was employed by Natsagdorj Dashdorj (1906-1937), a celebrated Mongolian poet, in his most famous poem “My Native Land” (not included in this book), in which he mentions the mountains and rivers of Outer Mongolia and demarcates the southern border of Mongolia at the Gobi Desert. He thus severs the connection between Outer Mongolia and Inner Mongolia, both of which were under Chinese rule at that time. This volume contains many examples that likewise demonstrate how poets use poems to define identity, environment, and territoriality. In the borderlands of Asia, people suffer from war, economic inequality, and environmental degradation because of modern development and nation-state building. In this collection of poems, we also encounter the anxiety, rage, and trauma felt by the poets and their peoples as they confront the daunting challenges of the nation-state system, modernity, globalization, and the Anthropocene. Desmond Kharmawphlang’s poem “Thaiang Buried Roots” (pp. 65-67) expresses his worries about environmental support for forest protection in the Khasi area of Northeast India. Mg Naing Lin’s poem “The Dream World” and Nayi Min Htet’s “The Abandoned” both express strong anti-war sentiments and longing for peace in Myanmar (pp. 154-158). Delgermaa Ganbat’s poem “At the Gate of Age of 24” criticizes current social problems, such as poverty, alcohol abuse, and tobacco addiction, in an urbanizing Mongolia (pp. 307-308). Yangzi’s poem “Time Bent Down” mourns the Qiang people who lost their lives in the devastating Wenchuan earthquake of 2008 (pp. 226-227). Despite this recurring anxiety and pain, the poets also eulogize their ethnic myths, rituals, and customs, so the volume both introduces them to a global audience and acts as a site of preservation and promotion of their cultures. Zhibde Nyima’s poem “The Great Prayer Festival of the Land of Snows” (pp. 251-266) is a hymn of the Tibetan people and an encyclopedic work based on the poet’s Tibetan religious, geographic, and historical knowledge. Aku Wuwu’s poem “Cliffs” draws on Yi myths and shamanistic rituals and turns the cliffs into a symbol of his ancestors’ “tombstones” (pp. 188-191). The editor has done impressive work to offer background knowledge for understanding most of the poems, especially the ones from Southwest China. Here I would like to share one more point for understanding a Mongolian poet’s work. In “Great Elegy Dedicated to the Poetry School of Khentii,” Galsanshukh Baatar writes, “The Great King of All, My Lord of the State / … / You have gone as the load of a parading cart—Warlord Gilgutei of Sunud’s cry after the death of Chinggis Khan” (p. 294). Here the poet alludes to a story in the Erdeni-yin tobči (Precious chronicle), a Mongolian chronicle of the seventeenth century written by Sagang Sechen (b. 1604). The Warlord Gilgutei of Sunud should be Gilügen Baatar (or Kilügen Baghtur) of Sönid. According to the Erdeni-yin tobči, when Gilügen Baatar escorted the body of Chinggis Khan back to the Khentii mountain for burial, he cried and sang an elegy to mourn his holy emperor. The poet ties Khentii to the grave of Chinggis Khan and praises the poetry school of Khentii for being a sacred place for all Mongols. Some minor mistakes occur in places. The Chinese term minzu rentong has been a fixed translation for “ethnic identity,” not “ethnic commonalities” (p. 17). Some names of administrative regions are also not standard. The Xizang Tibetan Autonomous Region is mistakenly translated as a “prefecture” (p. 37), while “Liangshan Yi Autonomous Region” (p. 47) is in fact a prefecture. Taken together, this work is a timely publication in dialogue with many scholarly trends, including the Sinophone, Zomia, and the Anthropocene, as understood through the medium of poetry. Although the contributors of this collection hail from a variety of nationalities and cultures, they share common difficulties and concerns in their lives. This volume is a crucial contribution to the fields of literary anthropology, literary studies, and Asian studies and is destined to become required reading for students in anthropology and comparative literature. Shu-mei Shih, “The Concept of the Sinophone,” PMLA 126, no. 3 (2011): 716. The concept of Zomia is a disputed one, as are its precise boundaries. It was first proposed by Willem van Schendel and expanded by James C. Scott. See James C. Scott, The Art of Not Being Governed: An Anarchist History of Upland Southeast Asia (New Haven, CT: Yale University Press, 2009), 13-22. For an introduction to Natsagdorj and a translation of his poem “My Native Land,” see John Gombojab Hangin, “Dashdorjiin Natsagdorj (1906-1937),” The Mongolia Society Bulletin 6, no. 1 (Spring 1967): 15-22. For this story, see Isaak Jakob Schmidt, ed. and trans., Geschichte der Ost-Mongolen und ihres Fürstenhauses, verfasst von Ssanang Ssetsen Chungtaidschi der Ordus (St. Petersburg, 1829), pp. 106-107.